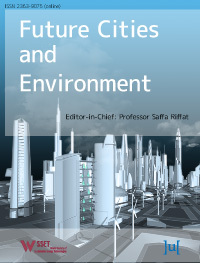 Future Cities and Environment publishes high quality multi-disciplinary research which aims to reduce the environmental impact of cities. Considering research in the areas of transport, urban planning, architecture and design, and energy and infrastructure, it publishes fundamental and applied research, critical reviews and case studies. This includes experimental development, demonstration and computer modelling. Should you wish to submit a paper, please visit our author guidelines. Alternatively, please feel free to contact our editorial team, should you want to discuss your paper prior to submission. Future Cities and Environment is now open for submissions. Please view our author guidelines or submit your manuscript.